The ultimate bonding and team building experience! And Mother Lode is the only place on the American River where you can combine rafting and zip lining in one fun filled day. 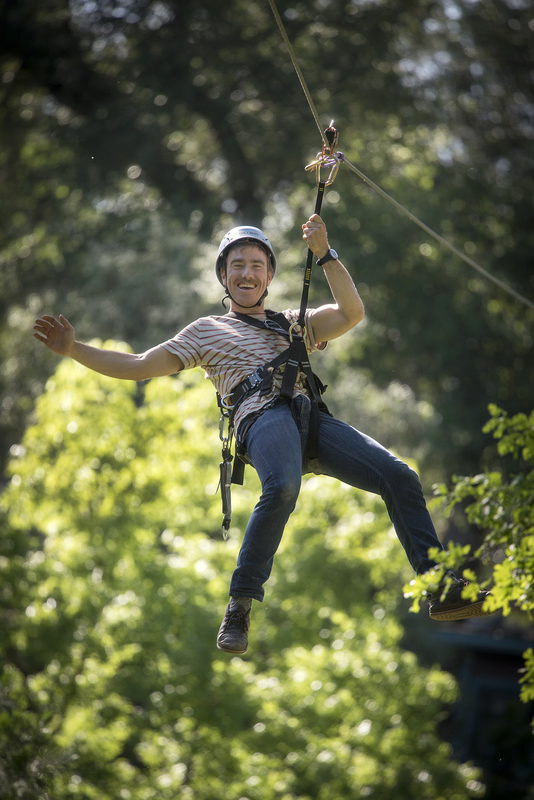 Our zip line and high ropes course will shape you into a team of friends comfortable with being challenged while having a blast. You’ll come out the other side of the course with more personal confidence and an increased sense of camaraderie with your group – perfect for then setting out on the river to enjoy the rapids of the South Fork. The Zip Line and High Ropes Course consist of a series of elements 20-40 feet above the ground. 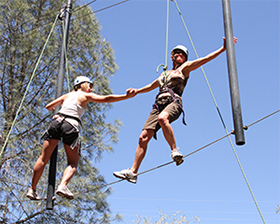 Experienced and skilled facilitators belay individuals and teams through each of the five elements. Our high ropes course is family friendly down to age 8 and designed with the philosophy of challenge by choice. You get to choose how far you want to push your personal boundaries. You’ll also have the chance to encourage your friends and family as they do the same. Although these activities were quite a bit more challenging, they were great too because they challenged us beyond our comfort zone allowing us to create a ‘new normal’. 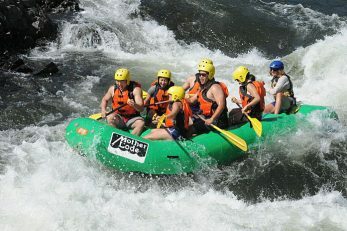 I still don’t know how Brian and I made it across your Pipe Dream!” Annie P.
The most popular raft trip in the State! A perfect fit for combining with the morning Challenge Ropes Course and Zipline. After lunch you will gear up for your river trip and launch from the banks of the River Center. The Gorge Run begins with about an hour of mellow Class II rapids. This enables paddlers to hone their paddling skills and grow accustomed to being on the river. A few miles down stream, the river canyon narrows into the granite-walled ‘Gorge’ where guests will experience a series of continuous Class III rapids including Satan’s Cesspool and Hospital Bar! Your day is finished when you reach Folsom Reservoir, where our shuttles will greet you with a cold beverage and a ride back to the River Center.